Another milestone has gone by since the last issue of 'Hyaku-nin Issho' - I'm now more than 3/4 of the way through the set! I certainly don't feel like I'm on the 'home stretch' yet, but it is very satisfying to have come this far. One thing I've noticed about being this far through the series is that whenever I'm talking with somebody about my work recently they always ask the same thing, "Have you decided what's next?" I have mixed feelings about hearing this question. Because, unlike most people's work, this series does have a specific ending date, it is quite natural to wonder about what will follow. On the other hand though, when I look back at my personal history and see how many times I quit what I was doing, no matter how successfully, to take up something else, it makes me a bit nervous to consider what work will come next. I don't want to get interested in something else ... yet! I want to concentrate on making these prints as well as I can. If I spend my time looking into the future instead of down at my workbench, the work will suffer. Those of you who have been collectors since the beginning know how much these prints have improved over the past eight years, and that is a tradition I intend to continue for another two years. So if you have any suggestions for my next project, please hold off just a little longer. During the final year of this project I will of course have to start considering such things, and at that time I'll be eager to hear your ideas. But for the moment, please help me to concentrate on doing this work as well as I can. I still ... no, we still have a long way to go. Furniture making? Yes, somehow I even got off onto that tangent too. I don't remember what started it, but I think the first piece I made was a wall mirror for my parents' bedroom ... There was a furniture store in the building next to my father's music shop, and they bought some of the next things I made. They approached me one day with an interesting proposal; they had won a contract to supply furniture for a new motel being built in the area, and wanted me to make some of it. This was quite a good chance to get started in business as a furniture maker, setting up a small shop for mass-production of the items for this order. But it was not to be. For by the time this offer came to me, I already had other plans, and in my pocket was an airplane ticket to London, England ... a one-way airplane ticket. It was now two years since I had left university, and my parents' patience with this overgrown kid hanging around their house was running out. This move was their 'suggestion'. London was one of the world's major centres of classical music; did I really want to be a flute player? OK, Get going! If you were to stick pins in a map of Japan to show where my collectors live, those pins certainly wouldn't be spread out evenly across the country. There would be a few scattered thinly at various spots here and there: places like Sapporo, Okayama, Osaka, Nagano, Niigata, etc., but far and away most of them would fall into two main clusters - one here in my local Tama area, and the other spread around along the rail lines that converge on Shinjuku (where I hold my annual exhibition). The collector we visit this time is from this latter group, but just barely. A couple of weeks ago I followed the Odakyu Line from Shinjuku right out to Western Kanagawa to visit Dr. Ryo Sugimori and his wife Fumiko-san in Yamakita machi. I met them first a few years ago when they visited the gallery, and now it was my turn to take the long journey. They had suggested the afternoon hours for the visit, and when I got there I found that this is because Sugimori-sensei spends every morning working in his medical centre that adjoins his residence. He is a general practitioner, and although well past normal retirement age is still carrying a full case-load of patients. The relative scale of the two buildings surprised me a bit - the clinic was quite large, but the Sugimori's home was very compact, just a couple of rooms, no larger than my own small apartment. This is not quite what I would expect from a Japanese doctor, but as became apparent during our conversation, I learned that most of their energies are expended on serving their community rather than their own ends, and a small and modest home quite suits their needs. The walls of the room in which we sat were covered with any number of citations and presentations from civic groups and the highest levels of government, that tell of his involvement in various community activities, and concern for his society is obviously uppermost in his mind. I know this is so, because I don't think more than a couple of minutes had passed after entering the room before we were deep in discussion of problems of contemporary Japan. I think that during our discussion I may have forgotten the Japanese 'rule' that says one shouldn't talk back strongly to one's elders, but this didn't seem to bother 'sensei', and before we noticed, nearly four enjoyable hours had passed by. But it was the other half of the garden that left the greatest impression on me. 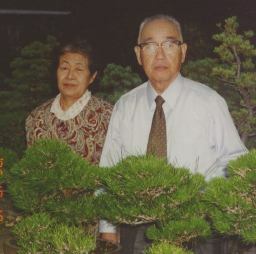 For here, where 28 years ago there was nothing but a large empty field, Sugimori-sensei and his wife have created a private forest - not a formal garden, but a natural woodland - deep and green and quiet. We wandered along a path winding among dozens of different species of trees and hundreds of different plants and bushes, across a small stream-bed with a few stone lanterns spotted about ... and the outside world disappeared. It must have been an astonishing amount of work for them to create this green 'world' hidden here inside the fence, year after year of planting, pruning, and watering. But what a magnificent result! Again, as we walked along, he worked on the plants, adjusting, maintaining and checking up on things. Everything in this garden was receiving constant care and attention. Nothing was ever 'finished', the ancient bonsai, the new seedlings, or the sturdy trees in the forest, everything was always growing, always changing. From birth to death ... always growing, always changing. And all under the guidance and care of these two gentle people. As we walked along, I did a bit of mental arithmetic - I am now 44 years old ... it took about thirty years to create this private forest ... yes, there's still time for me to do something like this - but only if I get started soon! First I'd have to find a good place, and then I'd need plenty of advice, because I'm certainly not a very experienced gardener. What do you think sensei, do you have any recommendations? 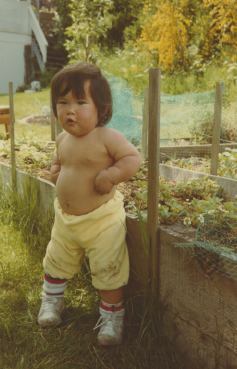 Back when my first daughter was about to be born (over in Vancouver, Canada), her mother and I went through a period where we were quite worried about what this child would look like. As neither of us could be considered particularly handsome, we imagined some nightmarish situations: say, her Japanese mother's fairly flat face, with my somewhat impressive English nose stuck in the middle of it ... things of that sort. We were thus quite relieved when the baby turned out to have what seemed to be fairly 'standard' features (as did the sister who came along a couple of years later). I was happy to see that this new little child turned out to have an almost completely Japanese appearance. Her mother though, was happy to see that this new little child looked almost completely Western! Were we seeing the same baby? Of course we were. It was our own eyes that were different. As the years passed, I came to realize that it was just not her mother and I who saw things this way. Canadians who met my daughter commented on her Japaneseness, and after we came to Japan, everybody here instantly recognized her as a foreigner. The explanation for this seemingly paradoxical behaviour is actually very simple, but has very wide ramifications. Whenever we see something new to us, we only notice the differences, never the similarities. My daughter's very Japanese nose and facial shape were invisible to her Japanese mother, who noticed only the Western eyes. This feature was unnoticed by me, who saw only those points that seemed particularly Japanese. This same sort of behaviour is also apparent on wider scales. A traveller visiting a foreign country for the first time looks about him in amazement ... the buildings, the people, clothing, the food ... he sees all those things that differ from his home environment. "How very different these people are from us." he thinks. When he returns home, he is full of stories about all the new things he has seen. His friends hear these stories, and their image of that country as "... different from us ..." is thus reinforced. I can easily understand how, back in the days before airplanes made travel a common part of our lives, and before TV brought foreign images into our homes, this 'selective blindness' of travellers created the general image that foreign lands were indeed all strange places inhabited by strange people. What is less readily understood is why, given these modern aids to contact and communication, nothing seems to have changed. In the case with which I am most familiar, that of Japan seen by Western eyes, and vice versa, I simply have to think back over my own experiences to see that this is true. Before I had much contact with Japan, my knowledge of this country came mostly from books, the media, and travellers to Japan or rarely, actual Japanese people. The 'only see differences' phenomenon came into play in a doubled form. The authors of those books (mostly Westerners) of course emphasized differences, and then I too, as I read, was mostly interested in differences, skimming past anything that seemed too familiar. So that, when after years of this kind of advance 'preparation' I finally arrived on these shores, I was convinced that I was about to enter a truly new world, where nothing would be familiar, and where all the rules would be different. How would I survive? Well, of course I did. That was many years ago, and I can now just laugh at those concerns and fears. I had no trouble whatsoever integrating into life here and becoming a 'normal' productive member of this society. This was possible because although the books were right in basic fact - yes there were differences - they had ignored the other 99% of the story ... people are people. The Japanese were in all essentials, just like me. They got up in the morning, went to the toilet, ate breakfast ... and so on through the day. They had the same desires, the same needs, and the same problems. They felt the same emotions, and the same bonds to the people around them. Maybe that 99% figure I mentioned is indeed a bit exaggerated. On further reflection, I think it should be revised upward! After all these years of living among the Japanese people, I am now totally convinced that those presumed 'deep' differences are in actual fact, nearly irrelevant. Shoes off/shoes on. Pull tools/push tools. Eat rice/eat potatoes. 'honne~tatemae'/'straight talking'. Such differences count for nothing when compared to the reality - two people standing side by side, pretty much identical in biology, and completely identical in real 'homo sapiens' culture. Our friend Emiko went to Egypt last year, not as part of a tour package, but as an independent traveller. We asked her before she went if she had been 'reading up' on the country in preparation, but she told us that no, she didn't want to go with her mind full of preconceptions. When she returned, after a couple of weeks in that 'exotic' country, a group of us waited eagerly to hear her tales ... but we were to be disappointed. She didn't have much to tell us. Her host family had been completely 'normal', the father a school teacher, the daughter a college student, etc. She said it was like visiting her own family! Of course, she had a good time visiting famous sights, and eating interesting food, but far and away the most valuable thing she brought home was that even in an apparently very exotic country such as Egypt, where the religion is different, the food is different, and the climate is different - there is one thing that is not different - the people. She learned in just a couple of weeks what took me years to learn, and what many people never learn. People are people. They are you and me. I know we can't change human nature. We will always tend to see foreign countries in this lop-sided way. It's just the way we are. But it would be nice to think that we can also learn to see other cultures as more like us, and less strange, less threatening. I am waiting for that big day when the astronomers will announce the news that they have finally discovered evidence of other civilizations out there in space somewhere. Perhaps then we will finally start to really understand how much alike we humans all are, when seen in comparison with someone (something?) really different. As I write this, it has been a half-year since my children left, and my life has long since settled down into the new pattern. The support and encouragement that I received from you readers and collectors was of great assistance in this. I'm not a person who is greatly bothered by loneliness, and unlike many people in this society, who moved from their original family directly to married life, and who thus have no experience of living alone, have spent quite a number of years living alone before. The initial adjustment is difficult, but once that is behind you, daily life is quite pleasant. But of course, I'm not a hermit. I obviously do need contact and support from other people, and very much appreciate the support I received from some of you during those difficult months. I should let you know that I made a short trip over to Canada during the summer to see the girls, and found that they have adjusted well to their new home and school life; they are very happy there. So please erase from your minds any image that David's life is dark and gloomy these days. He's eating good food, enjoying frequent 'dates' with his girlfriend, making good prints, taking camping trips, writing lots of essays, listening to lots of music, and spending way way way too much time in his new easy chair reading some of the books that have been in the 'waiting to be read' pile for too long. How does that famous novel start? "The train came out of the long, long tunnel ..."